This is cool and original little girl’s bag with chain used as handle made by Olga Verbitskaya. But its main highlight is not in this detail. It is in embroidered sample chosen for its decoration. 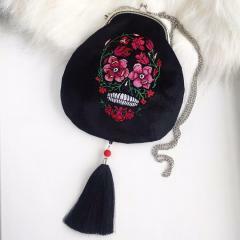 It is Disguised skull embroidery design. This name is not occasional: you firstly see its teeth in frightening smile and just then realize that they belong to skull hidden behind many beautiful flowers. This is spacious and convenient bag which is suitable for holding pet’s accessories or other necessary things. It has practical dark color and durable quilted surface. But it doesn’t mean it is boring. It is because of Infiniti dog love free embroidery design used for its decoration. This picture will be liked by each person who loves dogs and cats. It shows depth of feelings between human and pets. 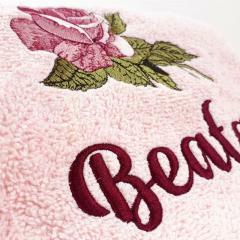 This is fragment of embroidered terry towel prepared by Bubu craft as gift for nice lady. 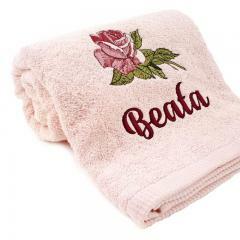 It is decorated with Mega Rose embroidery design and its future owner’s name. All embroidered elements and background fabric of this work piece has suitable color scheme. This photo shows smallest details of this embroidery to let you estimate it in all its beauty. 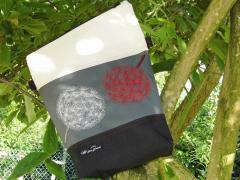 This picture shows pretty little handbag made by Johanna Hasselbrink‎ with very beautiful and original design. But at same time there are no very difficult elements in this work piece. You just need interesting material which reminds crocodile’s leather in metallic color scheme and Blue bicycle free embroidery design. Color scheme of embroidery sample is supported by shade of zip and attractive keychain in form of tassel. There is set of two pretty small handbags which are able to complete fashionable girl’s look. If you examine them carefully you may note that in fact they have same design. 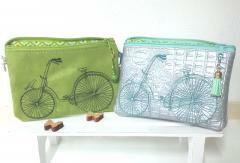 It is based in equal size and Blue bicycle free embroidery design. But because of absolutely different material and color scheme of embroidery sample they look as two separate work pieces. 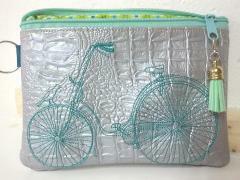 This is interesting and stylish textile bag which is able to be highlight of your look. It has spacious body made from dense fabric. But its front side is decorated with four color variants of one embroidery sample which makes in so original and unique. This sample is Dream Girl free embroidery design. Author changed not only color scheme of original embroidery but also its direction. 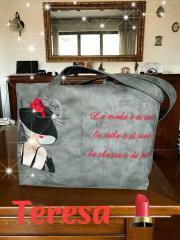 This is interesting and feminine bag which is suitable for everyday wearing. It is made from practical fabric of dark color so it doesn’t require special care. 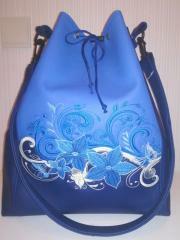 But its front side is decorated by French coquette machine embroidery design. This mystique portrait of French woman is added by thematic inscription. So color scheme of this work piece based on monochrome shades with come bright details. It is original kitchen accessory decorated by funny embroidery sample from our JBLON collection. 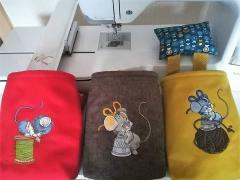 It is Nostalgic cat free machine embroidery design. Looking at this sad muzzle you can’t avoid smile. You also can use this interesting picture to raise your own mood. Just execute in on some of clothing or accessory you use often. 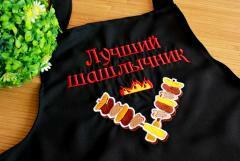 They can be kitchen apron, favorite t-shirt or other things. This is original contrast bag shown in interesting circumstances. It is placed on table lamp shade which gives it unusual light. It also underlines cool sample used for this work piece. 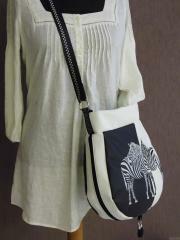 It is Zebra free embroidery design. There are two zebras standing together. They seem to be one because of recognizable pattern on their skin. Background fabric is chosen suitably. 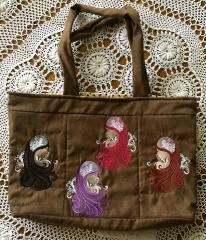 This is pretty little handbag made by Yoke Overeem which is definitely necessary for each girl. You can keep here all things you need every day: it can be hair accessories, cosmetics, pencils and pens or even money and cards. 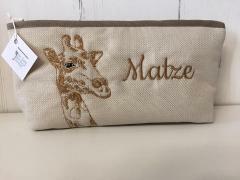 You will certainly love it due to Giraffe 4 embroidery design. It makes it really unique and original accessory which complete your stylish look. 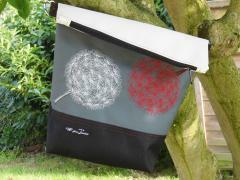 This is original and interesting embroidered bag made by Deborah Stogsdill Smith . It consists of many bright elements which perfectly combine with each other. 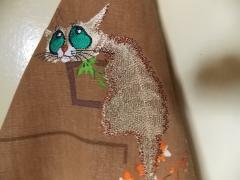 Main detail of this work piece us part decorated by Root man embroidery design. This original portrait of old forest man is added by some pieces of bright fabric placed as striped. 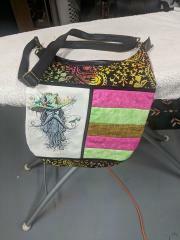 Bottom and top parts of bag are made from same fabric with floral ornament. This is original terry towel which can be good gift for man. 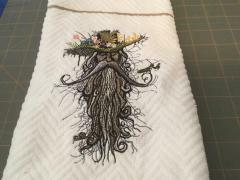 It is decorated by Root man embroidery design. It is portrait of fantastic creation from old legend. It is wise man with beard from roots and hat made of leaves, grass, flowers and mushrooms. It is able to become truly highlight of your bathroom: put it on noticeable place. 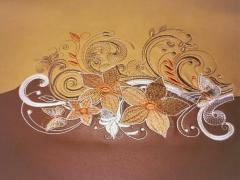 This is fragment of leather work piece decorated with Night magic bouquet embroidery design. This embroidery sample is one of best solutions if you need to embellish border between two materials. Picture is bright confirmation of this fact. Furthermore you don’t need to copy color scheme of original picture: look how shades chosen by author combine with main color of leather. 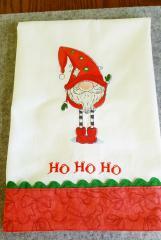 This is front side of nice kitchen napkin decorated with Gnome in red phrygian cap and boots embroidery design. This picture is added by bright fabric with abstract ornament and curved tape on border. Together they create stylish holiday accessory which gives merry mood for your kitchen. You also may use this idea to decorate other types of kitchen appliances. There is small but very convenient little bag which is indispensable for keeping some little accessories. It has almost square form so its body is quite spacious in spite of small size. Its front part is embellished by My beloved's face sketch embroidery design. It is portrait which seems to be painted by pencil. This picture is executing with just one color of thread. 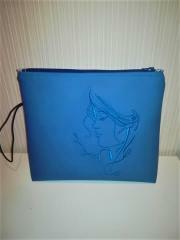 This is pretty small handbag which can be used as cosmetics bag or even wallet. It has simple but very well elaborated design. It includes all necessary detail to make this work piece convenient in usage. They are durable zip at top part and little handle to wear it. 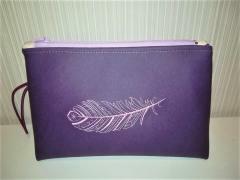 Due to Feather 17 machine embroidery design it is also stylish accessory which is able to complete your look.